absorbed in the body. Examples of absorbable sutures are the natural (plain and chromic) gut and synthetic types. A variety of materials are used to make nonabsorbable sutures. Some of these are silk, cotton, nylon, polyester, and corrosion-resistant steel wire. The most common suture material used in oral surgery is made of silk. All of these suture materials are available in different diameters. The smaller the number, the larger the diameter of the suture material. The 3-0 size is commonly used in periodontal surgery. The most commonly used suture material for oral mucosa is the 4-0 silk. To suture facial lacerations, the 5-0 suture size is commonly used. - When assisting with wound closures, grasp the suture needle with the needle holder approximately one third of the way between the eye of the needle and the needle point, and pass it to the dentist. When the needle is inserted into the tissue, the dentist may require you to hold the tissue firmly with tissue forceps. As each suture is tied, the dentist may have you cut the suture above the knot with surgical scissors, being careful not to cut it too short, since this may cause the suture to come untied. Scissors are used in dental surgery to cut tissues and sutures. The scissors used to trim excess or irregular soft tissues have one serrated blade to eliminate slippage. Those with smooth blades are normally used for cutting sutures or other fabric materials. Figure 5-9 illustrates the Dean surgical scissors. Many types of surgical scissors are commonly used such as the Kelly curved or sharp, Mayo curved or straight, and the Iris curved or straight. Figure 5-9. - Dean surgical scissors. instruments. The forceps that secure patient towels and drapes, hold suture needles, control hemorrhage, and grasp oral soft tissues are commonly used in most dental surgeries. We will consider them a miscellaneous group for our purposes. Towel-clamp forceps (fig. 5-10) are used to maintain surgical towels and drapes in the correct position during an operation. The working ends may have either sharp points or blunt flat tips that overlap in the closed position. Needle-holder forceps hold needles during suturing procedures. The typical needle holder has two short, rather blunt, serrated beaks with a distinct groove in each beak (fig. 5-11). The grooves provide space for the placement and retention of the needle. At the end of the handles, there is a graduated, notched- locking device that lets the dentist secure the suture needle in the suturing position as if the needle were an extension of the needle holder. Figure 5-10. 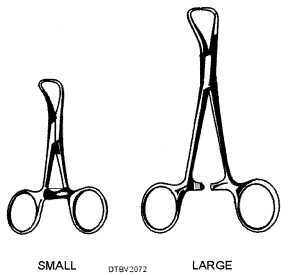 - Small and large towel-clamp forceps. Figure 5-11. - Needle-holder forceps.